Earlier this month, we showed you new set photos from the Marvel Netflix spinoff The Punisher, which confirmed that Daredevil star Deborah Ann Woll is returning as Karen Page. 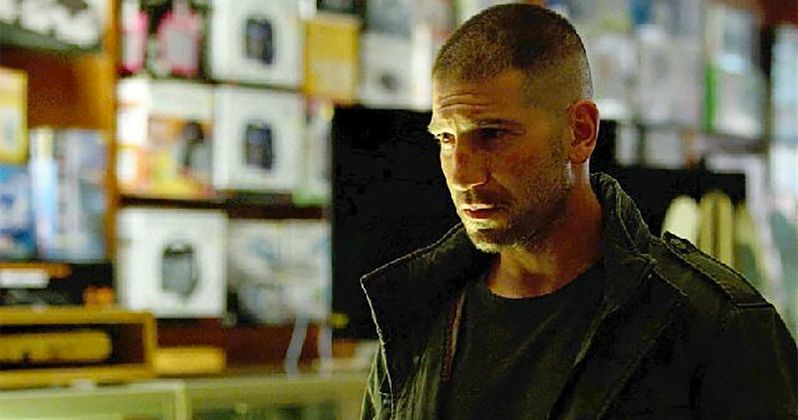 The photos showed the actress chatting with Frank Castle (Jon Bernthal) on a park bench, but today we have photos that shows Frank has a much different look, sporting a shaved head along with a full beard. We don't know what spawned this sudden change in Frank Castle's appearance, but we'll find out when the show debuts next year on the Netflix streaming service. Just Jared debuted these new images, which were taken on Wednesday, October 19 in New York City. The photos don't reveal much, aside from his new look, and the actor wasn't seen with any other cast members in these photos. Since there is very little we know about the story up to this point, it remains unclear if something specific happens to Frank Castle that warrants his new hairstyle. There had been rumors that one of the new characters coming aboard for The Punisher spinoff is Microchip, which were recently confirmed. Ebon Moss-Bachrach has come aboard to play this character, now dubbed Micro, a former NSA analyst whose secrets may be of great value to Frank Castle and everyone around them. Amber Rose Revah also signed on to play Dinah Madani, a highly-trained sophisticated Homeland Security agent who is vexed by the Punisher. Ben Barnes plays Billy Russo, Frank's Castle's best friend from his days in the Special Forces, who runs a successful private military corporation called "Anvil." With the photos that show Karen Page is a part of this Punisher spin-off, many have wondered what other characters from the Marvel Netflix universe will show up. It hasn't been confirmed if any other Daredevil stars such as Charlie Cox or Elden Henson will make any appearances in this spin-off, but this whole MCU TV universe has never had a shortage of crossovers. Rosario Dawson's Night Nurse has appeared in Daredevil, Jessica Jones and the most recent Marvel Netflix show, Luke Cage, which debuted this past weekend, but it remains to be seen if she will surface in Iron Fist, which is slated to debut March 17. Steve Lightfoot (Hannibal) will write the series' first two episodes in addition to serving as showrunner and Executive Producer. Jim Chory (Daredevil, Jessica Jones and Luke Cage) will also serve as Executive Producer along with Jeph Loeb (DaredevilJessica Jones and Luke Cage), Marvel's Head of Television. Marvel's The Punisher is produced by Marvel Television in association with ABC Studios for Netflix.